Cadence® Allegro® TimingVision™ technology provides an innovative and unique environment that allows you to see real-time delay and phase information right on the routing canvas. As data rates increase and supply voltages decrease in today’s high-performance interfaces (i.e. DDR3/DDR4, PCle® Gen3 and SATA), PCB and IC package designers have to spend more time to ensure that signals in an interface meet timing requirements. With increasing density, the effort to get to timing closure—ensuring all signals meet timing requirements—can increase significantly. Layout designers need new tools to meet this increasingly complex challenge. With the embedded route engine, the Allegro TimingVision environment provides real-time feedback during interactive editing and enhances your ability to develop a strategy for resolving timing on large buses or interfaces such as DDRx and PCIe. 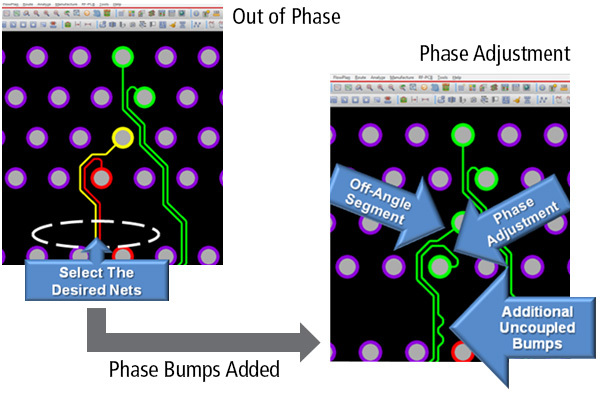 Coupled with Auto-interactive Phase Tuning (AiPT) and Auto-interactive Delay Tuning (AiDT) capabilities, this environment lets you speed timing closure of high-speed PCB interfaces by up to 75%. Auto-interactive Delay Tuning (AiDT) automatically generates tuning patterns on a user-selected routed byte lane or interface based on user-defined timing constraints and tuning parameters. AiDT computes the required length for the connections to meet timing constraints, and utilizes controlled push/shove techniques when adding tuning patterns. Bill Munroe of Cavium talks about how TimingVision technology helped his team achieve 4X faster timing closure on DDR3 and DDR4 memory subsystems.